Could technology help your older parent or grandparent?Perhaps they have asked you to help them upgrade their old computer with a new technology. There are some things you should consider when helping them get set up. 1. What do they have now? Do they have a home computer or laptop? Do they have an older phone or cellphone, or do they already use a smartphone? Do they have a dial-up Internet connection or high speed? Do they have wi-fi? 2. What are their current skills? Have your loved ones used computers at work but not at home? Do they have an old phone, or are they already using a smart phone and understand touch technology? 3. What do they want and need? Do they want to video chat and play games? Research shopping deals? Or do they have larger goals like learning a new skill or starting a new business while in retirement? Also, do they have any special physical needs that you should consider? Getting MobileThe 2014 Pew Research Study “Older Adults and Technology Use” found that more and more seniors are going online, and many are going straight to mobile technologies like tablets, e-readers and smartphones. Kamber says he sees this at his own training centers in New York City, where his organization offers seniors classes in everything from the basics of using computers to how to launch an online business. They’ve now started offering special classes in touch and mobile technology. “Like a lot of us, seniors want to have a light, portable device that helps them stay connected to friends and family and have access to entertainment and information,” he says. Kamber suggests when considering smartphones or tablets for seniors, look for those that have the most versatile options out of the box for increasing font size, voice activation, tech-support and audio enhancement for those with hearing loss. You should look for devices that come with features that will be of most use to the person you’re buying for. Many seniors work best with tablets when they also get a portable keyboard. 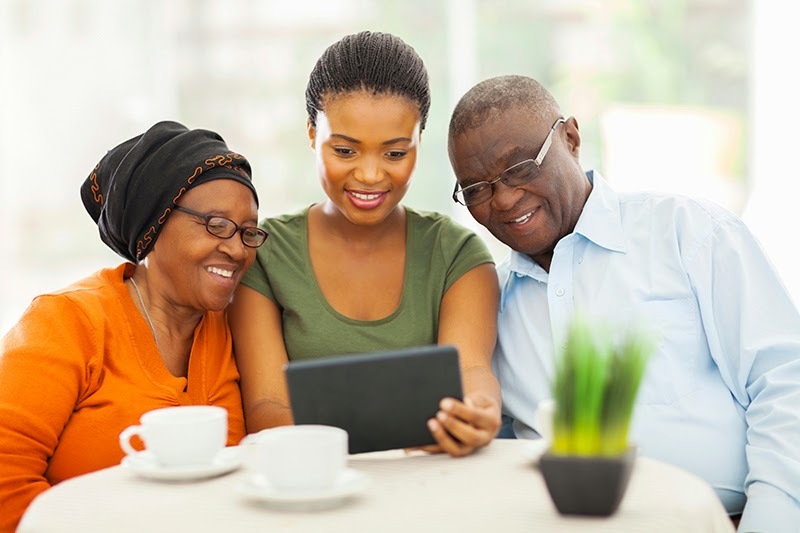 Apps for SeniorsMany of the applications your older loved one may want to use are likely to be some you enjoy, while others may be more specific to their personal needs. According to Kamber, among the most popular are those for chatting online, researching shopping items, tracking their health needs and their budget, and accessing entertainment. Communication: Apps like Skype, Facebook, Facetime and Pinterest help older and younger people stay connected. Kamber says Tumblr is popular among seniors who want to blog. If you are helping your loved ones set up Skype or Facebook, you may want to help them load in contacts. Health and Wellness: Applications like MyFitnessPal, Loseit and NikePlus allow users to monitor their exercise routines and calorie intake and output. Others like WebMD can help monitor or check symptoms; Medcoach, Drugs.com and Pillboxie can help track their daily medications. There are also applications for tracking glucose levels for diabetics and blood pressure. EmergencyLink stores all vital information about emergency contacts on your device, including medications you are on, your doctor numbers and your emergency contact. Budgeting: Mint, Evernote and Check are popular apps for tracking budgets and spending habits. General Help: Eyereader can turn your device into a magnifying viewfinder for reading small print, while Voice-Reading can turn text into audio. And Park’n’Forget can help you find your car, while FindMyIPhone and FindMyDroid can help track lost devices. Set-Up and SupportPicking the right device and applications will get things started, but helping your loved ones feel confident using their new laptop or tablet will make a world of difference. If your loved ones have some experience with computers or mobile devices, you may help them do the initial set-up yourself. You can sign them up for services, subscriptions and applications and set up font size and voice prompt options on the device and within applications; and you may be able to help teach them some of the basics of computing, emailing and touch technology. But Kamber says many seniors, even those who may have used computers at work, will benefit from more in-depth and specific training for their needs. Kamber says he’s seen seniors flourish when new technology is put in their hands. “I’ve had people tell me we changed their lives,” he says. “They’ve found new independence, friends and a sense of confidence that they hadn’t expected.” The important thing is to help pick the correct technology for their needs and to give them the support to make the most of it.